Available for sale in our Online Shop Cables24 Balun 75-120 ohm impedance adapter RJ-45 female BNC female Dual G.703 E1 / E3 and Balun 75-120 ohm impedance adapter RJ-45 female Dual DIN 1.6 / 5.6 female at the best price, fast shipping. compact and flexible solution that enables impedance matching needed to connect equipment or communication lines coaxial (75 Ohm) to computers or rolls twisted pair (120 Ohms). 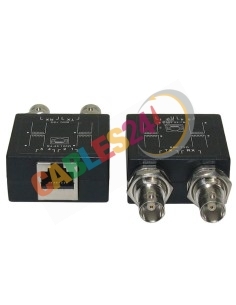 These adapters have 2 interfaces on the side so coaxial transmission signals (TX) and receive (RX) are transmitted over a single twisted pair bidirectional roll. They are especially useful for converting / receiving lines of communication operators (coaxial) to twisted pair wiring network. Balun Module There are 2 products.